Sabine Pass. Train 2 at Sabine Pass started producing LNG on July the 28th, and on September the 16th, Cheniere announced that it had “taken control” of Train 2 from Bechtel (its EPC contractor). The turnover is being done in co-ordination with a previously planned outage, to improve the performance of the flare systems at Sabine Pass, as well as to perform scheduled maintenance to Train 1 and other facilities. Under a sale and purchase agreement (SPA) with Gas Natural Fenosa, the date of the first commercial delivery for Train 2 of the project, is expected to occur in August, 2017, upon which, the SPA’s 20-year term commences. (Shell controls the commercial cargoes from Train 1, under a 20-year SPA). Trains 3 and 4 at Sabine Pass are expected to be “substantially complete” by the third quarter of 2017. Train 5 is to be completed in mid-2019, and Train 6 has not yet pursued a FID. Each train can produce about 4.5 million tonnes per annum (mtpa). SPA holders at Sabine Pass also include: the Korea Gas Corp. (Train 3), GAIL (Train 4), Total (Train 5), and Centrica (Train 5). Cove Point. Another former LNG import terminal, the Dominion Resources’ Cove Point project in Lusby, Maryland (on the Chesapeake Bay), will add 5.25 mtpa in liquefaction capacity. Scheduled to begin commercial operations in late 2017, Cove Point’s LNG capacity is “fully subscribed” under 20-year terminal service agreements with U.S. affiliates of the Japanese trading company, Sumitomo Corp., and GAIL (India) Ltd. Each wholesaling supplier has contracted for half of the marketed capacity. Sumitomo, in turn, has announced agreements to serve Tokyo Gas and Kansai Electric Power Co.
Cameron LNG. 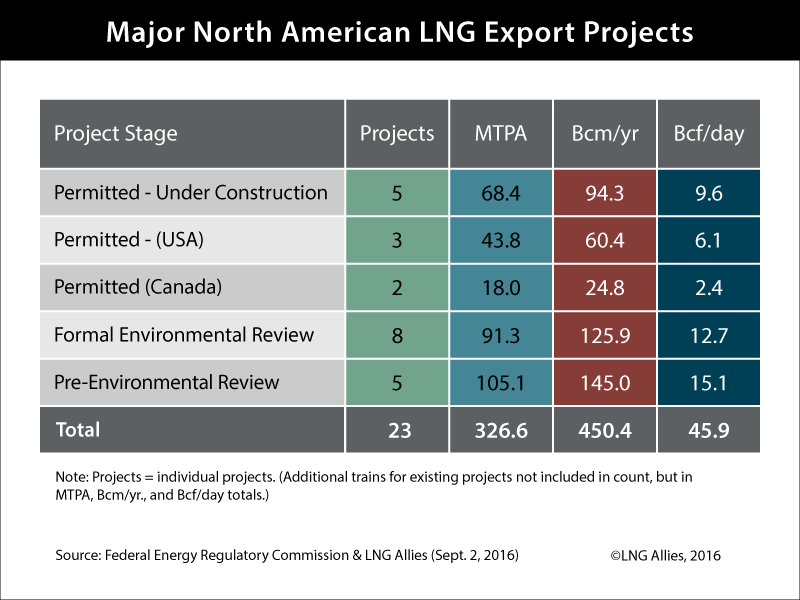 The third U.S. LNG export project is expected to commence commercial operations. 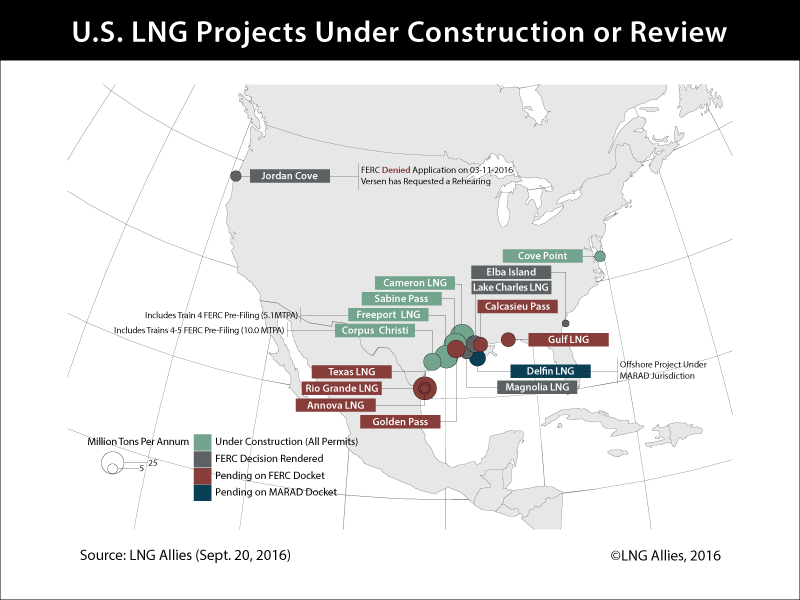 Came ron LNG is a joint venture of affiliates of Sempra Energy, Engie, Mitsubishi Corp. (through a related company, jointly established with Nippon Yusen Kabushiki Kaisha) and Mitsui & Co. As with Sabine Pass and Cove Point, Cameron was originally designed as a LNG import terminal. Trains 1, 2, and 3 are under construction, and are expected to produce LNG in early, mid, and late, 2018. Each train will produce about 5.0 mtpa, with each of the two minority owners, as well as Sempra, which owns 51.3%, taking one third of the output under 20-year agreements. Cameron has also received approval from the U.S. government to build two more trains, along with another storage tank at the site, and to export an additional 10 mtpa. However, the partners have not yet sought a FID on the two-train expansion. Freeport LNG. The fourth U.S. LNG import terminal that is being expanded to include liquefaction and export capacity, Freeport LNG has three trains under construction on Quintana Island, Texas. Approximately 13.2 mtpa of the 14.0 mtpa of production capacity of the three trains, have been contracted under 20-year liquefaction tolling agreements (LTAs), as follows: Osaka Gas and Chubu Electric for Train 1 (2.2 mtpa each); BP Energy Co. for Train 2 (4.4 mtpa); and Toshiba Corp. and SK E&S (2.2 mtpa each), for Train 3. The three trains are on schedule to commence operations by September, 2018, February, 2019, and August, 2019, respectively. Freeport has applied for U.S. government permits to build Train 4, which could begin operating as early as 2021. Corpus Christi. The first “greenfield” LNG export terminal to be constructed in the United States is now being built by Cheniere Energy at Corpus Christi, Texas. Liquefaction Trains 1 and 2 at Corpus Christi are expected to each produce 4.5 mtpa, and will commence their operations in the first and second quarters of 2019. Cheniere has secured some 8.42 mtpa “take-or-pay” -style commercial agreements for this project from Pertamina, Endesa, Iberdrola, Gas Natural Fenosa, Woodside, Électricité de France (EDF), and Energias de Portugal. Train 3 has not yet pursued a FID. Fred H. Hutchison is Executive Director of LNG Allies, and Our Energy Moment. LNG Allies is a U.S. non-profit organisation working to expedite and maximize U.S. liquefied natural gas exports, to create a more liquid, global, natural gas marketplace, enhance the energy security of America’s allies, and improving economic and environmental conditions, worldwide.